Which fossil fuels is your bank financing? Coal mining: As leaders of climate-vulnerable states called for a global moratorium on new coal mines, top banks financed $42.39 billion for companies active in coal mining, led by Deutsche Bank with $6.73 billion. Coal power: In spite of a recent study concluding that the current pipeline of planned coal power plants would put the 2°C climate target out of reach by the end of 2017, these banks financed $154 billion for top operators of coal power plants, led by Citigroup with $24.06 billion. Extreme oil (Arctic, tar sands, and ultra-deep offshore): Future development of most of these high-cost, highrisk oil reserves is incompatible with even the 2°C target, but banks financed $307 billion for the top owners of the world’s untapped “extreme oil” reserves, led by JPMorgan Chase with $37.77 billion. Liquefied Natural Gas (LNG) export: Banks financed $283 billion, led by JPMorgan Chase with $30.58 billion, for companies involved with LNG export terminals in North America, which have enormous carbon footprints and are stranded assets in the making based on a 2°C climate scenario. Under pressure from global civil society, several U.S. and European banks have announced restrictions on financing for coal since 2015. However, most of these policies fall well short of the necessary full phase-out of financing for coal mining and coal power production; as the report’s grades for extreme oil and LNG export finance indicate, banks continue to finance these sectors on a nearly unrestricted basis. Banks also continue to fall distressingly short of their human rights obligations according to the United Nations Guiding Principles on Business and Human Rights, leaving banks complicit in human rights abuses by several of their corporate clients in the fossil fuel industry. 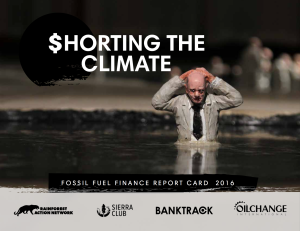 Download the full “Shorting the Climate” report here. Download “Appendix A: Mountaintop Removal Coal Mining Production Data” here. Download “Appendix B: Coal Mining Companies” here. Download “Appendix C: Coal Power Companies” here. Download “Appendix D: Extreme Oil Companies” here. Download “Appendix E: North American LNG Export Projects” here. Download “Appendix F: Bank Rating Rationale” here. Note: this report is the seventh in an series put out annually by the Rainforest Action Network. Oil Change International was pleased to contribute data to the 2016 edition.